The Environmental Protection Agency’s pending proposal to cut the amount of corn ethanol that must be blended into gasoline in 2014 by 1.39 billion gallons would lower U.S. greenhouse gas emissions by the equivalent of 3 million tons of carbon dioxide (CO2e) – as much as taking 580,000 cars off the road for a year. It is now clear that the federal corn ethanol mandate has driven up food prices, strained agricultural markets, increased competition for arable land and promoted conversion of uncultivated land to grow crops. In addition, previous estimates have dramatically underestimated corn ethanol’s greenhouse gas emissions by failing to account for changes in land use. 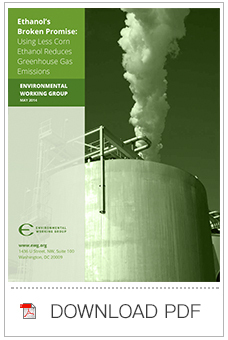 In 2012, an Environmental Working Group study found that from 2008 to 2011, more than 8 million acres of grassland and wetlands were converted for corn alone.1 EWG’s new analysis shows that these land use changes resulted in annual emissions of 85 million to 236 million metric tons (CO2e) of greenhouse gases. In light of these emissions, many scientists now question the environmental benefit of so-called biofuels produced by converting food crops. A few recent studies still claim that corn ethanol produces fewer emissions than gasoline, but a careful look reveals that their methods don’t properly account for land use change. Studies that do factor in land use change show that using food crops to produce biofuels – once considered a promising climate change mitigation strategy – is worse for the climate than gasoline. Transportation accounts for 28 percent of greenhouse gas emissions in the United States.2 In an effort to reduce these emissions, Congress passed a law in 2005 requiring oil companies to blend socalled renewable fuels – produced by converting biological material (biomass) into ethanol, biodiesel or other liquid fuels – into vehicle fuels. Two years later, the Energy Independence and Security Act (EISA) dramatically increased the amount of biofuels required to be blended into gasoline. This mandate, formally known as the Renewable Fuel Standard (RFS), was intended to reduce U.S. dependence on foreign oil imports and reduce greenhouse gas emissions. The Renewable Fuel Standard requires that annual biofuel use increase every year, from 9 billion gallons in 2008 to 36 billion gallons in 2022. Of the 36 billion gallons of biofuel required in 2022, up to 15 billion gallons can be produced from corn. The remaining 21 billion gallons (dubbed “advanced biofuels”) would have to come from a biomass-based feedstock that is not corn. This requirement was intended to help get advanced fuels off the ground, but commercial production has fallen short of the mandated level every year since the law took effect in 2009. In reality, the law has produced a flood of corn ethanol and only a trickle of the advanced biofuels that were the goal of the act. Every year, as required by the Renewable Fuel Standard, the EPA sets the mandate for the annual volumes of biofuels to be blended into gasoline, called the statutory Renewable Volume Obligations (or RVOs). The EPA sets the RVOs every year so that ethanol plants know how much to produce and oil refineries know how many gallons to blend into gasoline. In November 2013, EPA proposed to significantly reduce the 2014 required volumes of biofuels to be blended into gasoline.3 In its proposal, EPA reduced the RVOs for advanced and cellulosic, and, for the first time since the Renewable Fuel Standard was implemented, also proposed to reduce the mandated volume of corn ethanol. Reducing the corn ethanol mandate would reduce the demand for corn, thereby reducing the incentives for converting land to corn production.